"Aged liked a fine wine," is a popular adage, but not all wine gets better with age, and the best wines aren't all old. No need to be embarrassed when you're drinking that fine bottle of 2009 vino, we break the concept of wine vintages down in our practical guide. Vintage is a supposedly fancy word that’s bandied about freely in many circles. From vintage vinyl records to vintage photography, we’ve co-opted the term as a catchall to describe things that are rare, valuable and often very old. But the circle from where the word vintage originates uses the term more strictly. When you’re talking about wine, “vintage” means something a bit more specific. Learning what wine vintages mean can help you choose a good bottle of wine for your next dinner or your cellar. What is a Wine Vintage and Why Does it Matter? When you see a year on the label of a wine bottle, that’s a vintage. The vintage refers to the year that (most of) the grapes in the bottle were grown and harvested. Why does vintage matter? For one, the vintage tells you the age of the wine. But that fact alone isn’t enough to tell you about the probable quality of the bottle you are about to buy. This is because different wines mature at different rates and with different characteristics. Complicating matters further, when the wine is at its true “peak” is somewhat subjective—that is, your tastes may not comport with those of the critics. Although we use vintage to describe anything old and/or collectible, the term originates from wine culture. The roots of the word vintage can be traced back to the Latin word vīndēmia, which means, literally, “a gathering of grapes.” And that’s how wine folks use the word today: to refer to the year that a wine was harvested from the vines. Modern language uses similar verbiage to describe the fruits of the labor of viniculture. In French, the word for wine is Vin. In Italian, it’s Vino. In Portuguese, it’s Vinho. What vintage really drives at is whether or not that particular year was a good year for the wine you’re beholding. Wine grape growing regions, like sports teams, have good years and bad years. With sports franchises, billy goat curses or playoff beards are the x factor. But with wine, it’s the weather. Wine grapes, like children, require a conducive environment in order to ensure a healthy, well-balanced maturation and development. If the weather is unseasonably warm, the grapes ripen faster, which they don’t like. Again, like children, if a grape is forced to grow up too fast, it risks skipping over some of the character-building phases of its development. If a season is too wet, then the grape may become diluted or it may literally rot on the vine. (I have no child rearing analogy for that.). Unless you’re a human almanac, you won’t be able to recall the growing conditions for every year in every subregion on the planet. Luckily, you don’t have to, thanks to the vintage chart. Wine vintage charts are put out by vintners, wine merchants, wine critics and other know-it-alls as handy guides for wine drinkers like you—you know, the ones who haven’t been TiVo-ing The Weather Channel for the past decade. Region – The chart itself will usually start with a larger region and then drill down to subregions. For example, you could be looking at a French wine vintage chart that breaks down into Champagne, red/white Burgundy, red/white Bordeaux, Chablis, etc. Or you could be looking at a North America vintage chart that starts with California, Oregon and Washington and breaks down to Finger Lakes, Sonoma Valley, etc. Vintages – Vintage is represented as a year on the corresponding axis to region. It must be remembered that part of the enjoyment of wine is the variation in quality from one vineyard to another within a single vintage. Provenance is crucial: the most expensive wines from the most recent vintage can turn to vinegar within months if stored badly – and we have assumed perfect maturation conditions. Furthermore, many of the New World regions where wine grapes are grown (California, Australia, Oregon, New York, Chile, etc.) have naturally stable climates or artificially stable growing conditions (e.g. irrigation). For these growers, the weather doesn’t play as big role in the quality of the harvest as it did in climatically volatile France, back when vintage charts came in vogue. So that was over a decade ago, and we’re all still using wine vintage charts. Maybe. Unfortunately, he didn’t factor in our society’s excessive and insatiable hunger for information, no matter how exponentially the returns become diminished. Just about everyone and their brother still puts out a wine vintage chart in a wide range of formats, including a flotilla of smartphone apps, such as VintageChart+, Wines and Vines and Hello Vino. And who knows, maybe global warming will shake things up a bit, causing a boom in the post-apocalyptic weather wine vintage chart industry. Given that it takes all of two seconds to research a wine vintage, it certainly couldn’t hurt to look it up. 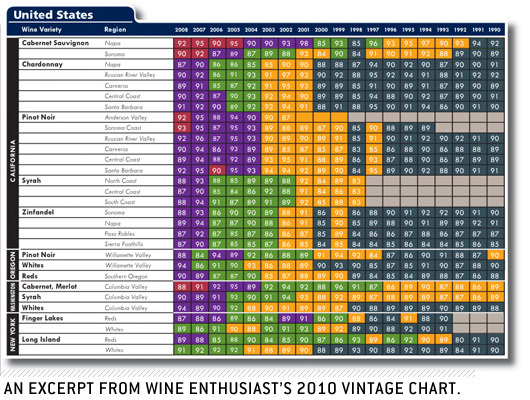 Using a wine vintage chart is actually much simpler than the sometimes verbose vintage notes make it out to be. If the critics declare that Mother Nature smiled upon Bordeaux this year, then it means that the wine that’s usually good from that region will probably be even better, and the wines that are usually bad from that region will probably be less bad. A rising tide lifts all boats higher, or so they say. But remember: there are always exceptions. So, if you taste a crummy 2007 Napa Valley Cabernet, you don’t have to picket the homes of the Wine Spectator editors with signs calling them a big fat phony. Myth: The term “vintage” primarily denotes quality. In the beginning (or as close to it as anyone cares to remember), there wasn’t a vintage wine for every year. Only the best years’ harvests were declared with a vintage, while the others were blended or bottled as non-vintage (NV). Today, only certain highly regulated wines, such as Port, are that picky about declaring vintages. 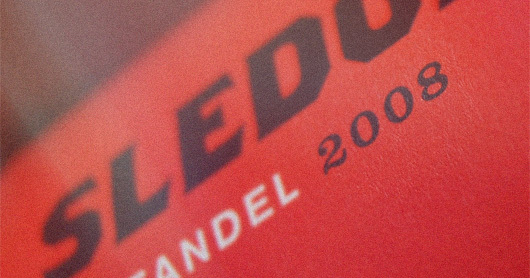 Most wine producers will declare a vintage every single year. Furthermore, non-vintage wine isn’t necessarily the “seconds” bottled during an off season. Some wine producers blend non-vintage wines for the sake of year-to-year consistency. Myth: Vintage wines must contain grapes from a single year’s harvest. In the U.S., a vintage wine can contain up to 15% of wine from other years and still carry a vintage year. The same is true for the European Union, Australia and New Zealand. Chile, South America and a few other wine producing countries allow up to 25% blends. The restriction is tighter in some regions and subregions. For example, wine from a region recognized as an American Viticulture Area (AVA) must contain 95% grapes from the same year. Myth: All vintage wine improves with age. The correct saying is “aged like fine wine” and it doesn’t apply to any old bottle of Boone’s Farm. Your inexpensive reds and whites won’t improve over the years. In fact, you should drink most $8 to $20 bottles of white wine within one to three years and most bottles of red wine within one to two years. Nope. Vintage just means it has a year on it at all. That could mean last year or last millennium. When it comes to wine, treat the word vintage more like you would the word circa (except more precise). Myth: Choosing the right vintage is crucial to getting a good bottle of wine. This isn’t so much false as much as it’s not always true. In regions where the weather is steady and predictable, such as Australia or California, there’s not going to be a lot of wild fluctuation in grape harvest quality from year-to-year. So, your chances of getting a “good” vintage are considerably better. The truth about wine vintages is that they are far less daunting and far less useful than many of us presume. That being said, for die hard wine geeks, it adds another layer of history and data to factor into the pastime of analyzing, tasting and enjoying fine wines. If you’re but a casual drinker of wine, rest easy knowing that you’re not a charlatan for not knowing the weather patterns of Côtes du Rhône like the back of your hand. But if you want a few more clues to help you put your finger on what went right or what went wrong with the wine you’re enjoying, vintage provides an enjoyable lead for your investigation. Unaware that South America is a country. Learned more than I expected!